Those crumbs that fall between the keys might as well as be a smorgasboard for infection. If all of those germs described above have collected on your keys as you type away and take a bite of your McMuffin – well that is pretty gross. You are eating those germs, and then incubating them in your body. Long story short, you may not want to eat at your desk. I know, we are not six years old anymore. Still, too often people neglect to wash their hands or do so properly, hence why I’m reiterating this. Just do it. A good rule of thumb is to massage the soap into your palms, between the fingers – basically every crack and crevice – while singing happy birthday (in your head). All in all, it is just the respectful thing to do for those around you as well, since it will help prevent the spreading of germs. Take a walk over to an employee that you do not like, and sneeze on their computer instead. JUST KIDDING. However, I have witnessed co-workers sneezing in their cubicles, and not covering up their mouths. As a result, their workspace becomes a breeding ground for whatever ailment they are carrying. 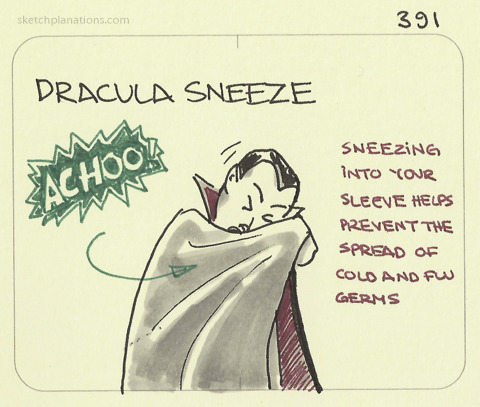 When you sneeze, cover your mouth like Count Dracula. Sneezing into your elbow is a good practice when there aren’t any tissues readily available. Keep a roll of cleaning wipes in your desk drawer, and give your work area a good wipe down once a week – or more if needed.